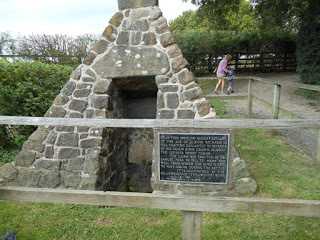 Walking Bosworth’s Battlefield – History… the interesting bits! Last year I took my 9-year-old son and 40-something husband to visit their first battlefield. 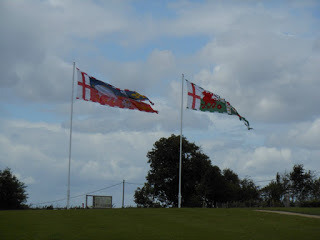 We were holidaying in Derbyshire and decided to drive down to Leicestershire and visit Bosworth. With all the hype around the discovery and re-burial of Richard III, it seemed a great way to show a 9-year-old the story of a battle. He, of course, knows a little of the Richard III story. He can identify the king’s portrait and knows he was involved in the Wars of the Roses, but we don’t linger on the Princes in the Tower too much. I don’t think he is as familiar with Henry VII, but he can tell you all of Henry VIII’s queens, in order, and tell you their fate. So taking my son to the battlefield was a way of giving him a place and time where he could visualise the events and the people. However, what I found surprising was the effect it had on my husband. Hubby is a bit of a computer geek and into all the mod cons. He never had an interest in history before he met me, and even now I can see his eyes glossing over if I talk too much about the past – 15 minutes a day is usually all he can take! I have visited battlefields before; Waterloo, Stamford Bridge, Hastings and a few others. The calm serenity always amazes me. I expect to hear the echoes of battle, the cries of the wounded, clashes of arms and the shouted orders of the battle’s commanders – and the thunder of the horses hooves during the cavalry charge. 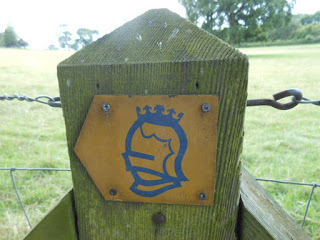 At Bosworth, if you close your eyes tight, and listen intently, you can almost hear it….. The Battlefield trail is a wonderful leisurely walk. It’s not the actual battlefield; they found that a short distance away a few years ago, but it is Ambion Hill. And standing at the memorial you have a panoramic view of the area; you can imagine the 2 sides facing each other, troops in the thick of it and those waiting to engage. My son listened in awe as I described the death of Norfolk and the final, desperate charge of Richard III; and Percy’s men standing, watching and waiting – possibly very close to where we were stood at that moment. 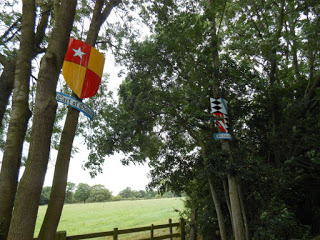 As you walk round the hill and through the woods, there are markers, pointing the way; and viewpoints and information posts telling the story of the battle and explaining the technology and tactics used. One marker explains the use of the longbow, how it dealt death from afar. The marker explained where the archers were positioned during the fighting; you almost expected to look to your right and see them raising their bows to the air. 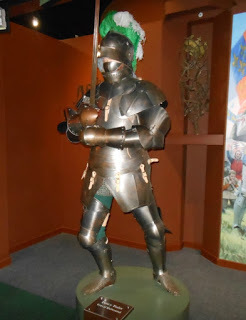 My son was fascinated by the idea that children as young as he was had already started their knightly training, that there were only about 1,000 knights in the whole of England. And I was amazed to discover that many who could be knights chose not to, in order to avoid the duty and responsibility that came with knighthood; these men were simply called esquires or gentlemen. It amazed my husband to discover that cannon and handguns were in use in the battle. 1485 seems to be too long ago for men to have used gunpowder. The handguns were large and cumbersome weapons, too large for one hand to use; guns were still very much in their infancy. 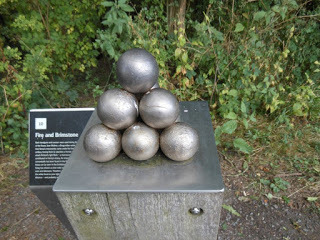 However, it was a scattering of cannon balls and other small metal objects (such heraldic badges, spur rowels and coins), found by metal detectors, which finally meant the location of the battlefield could be confidently identified. Although the general battlefield has now been identified, we still don’t know where individual parts of the action took place. We can’t say for certain where the action between Norfolk and Oxford took place, nor where Norfolk fell. 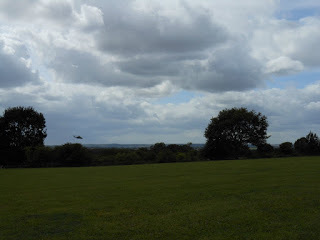 We can’t tell where Stanley and his men were standing, watching for that turn in the battle that made him decide to join Henry Tudor’s forces. But the specifics don’t matter as much as I expected they would. The battlefield provides its own story. And the fact you can’t say exactly where each part of the action happened serves to highlight the confusion of a battle. When you’re on the ground, in the thick of it, fighting for your life and your king, you wouldn’t be looking round to see where on the field you were. You would be looking to your own survival, fighting the man in front of you while watching your back. So the locations of events are vague, but that they are remembered and commemorated is what matters. Whether the marker is where Richard fell matters less than that there is a marker to the fallen king. And once you have walked the Battlefield Trail, there is the Heritage Centre to visit. The Centre offers wonderful background to the battle, told through the voices of those involved: a serving girl at a local inn, a mercenary’s wife, an archer. The 2 armoured kings stand watch over you as you view artefacts found on the field of battle and study maps and videos explaining the battle and the troop movements. 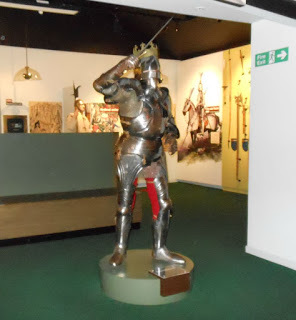 The Heritage Centre is very hands-on; children can try on the armour and test out the helmets. You can test your ability to draw a longbow; it’s not as easy as you think. By far the most dramatic display is the little corner dedicated to the Barber-Surgeons. The tools of his trade are displayed and a skeleton depicting the wounds of one soldier from the battlefield. Given the recent discovery of Richard III, and the detailed descriptions of his wounds, this seemed a particularly poignant display. Walking the battlefield is a humbling experience. 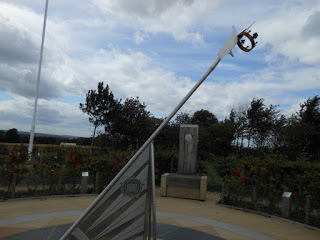 So little is known about the men who fought and died in these fields on 22nd August 1485. And, yet, the date marks so much change in English history: the end of one the Plantagenet dynasty and the start of Tudor rule; the end of the Middle Ages and the beginnings of the Renaissance. Just around the corner were the marital problems of Henry VIII and the English Reformation and the subsequent, glorious reign of Elizabeth I. But the men who fought that day would know nothing of the significance of the battle beyond that moment. Article originally published on The Review on 19th August 2015.